Wonorejo Dam is a dam located in Wonorejo village, Pagerwojo district, Tulungagung regency, East Java province, Indonesia. It is about 12 km of the center of the city. With about 122 million meters cubic capacity, Wonorejo dam become one of biggest dam in Indonesia, even South-East Asian. Wonorejo dam is declared in 2001 by Indonesia President, Megawati Soekarnoputri, after built almost 9 years since 1992. Wonorejo dam has function as the power of electricity and source of drink water in East Java province. This dam is also functioned to avoid flood in Tulungagung, together with Neyama Dam in Besuki district. 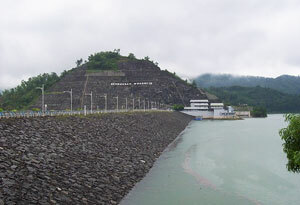 Now on, Wonorejo dam is also functioned as one of tourism object in Tulungagung, beside Popoh Beach. Some facilities are built around Wonorejo Dam, one of them is Swah-Loh Resort. Beside functioned as PLTA and as irrigation, Wonorejo Dam is also introduced as tourism object that presents comfortable and recreation facilities. In its concept, Wonorejo Dam is aimed to supply clean water in Tulungagung area and also as irrigation facility in Pagerwojo area. As one of tourism object in Tulungagung, Wonorejo Dam is equipped with canoe, camping area, helicopter lines, fishing and standart circuits for Motocross event and off road. With about 15 km from the center of the town, Wonorejo Dam is easy to reach. Beside that, the visitors will enjoy their journey to Wonorejo Dam, because it has beautiful scenery and completed with resort and villa with high quality. Its hill nature is fresh with cool valley and clean air, very comfortable and natural in tropic area. Wonorejo dam is using foundry concept in a hill and has artistic value for the visitors. This tourism object is also has clean environment that make the visitors will keep up for a long time. Many events are held here, both in region and national level. The annually events are; national paper kite competition, motocross and 4WD OFFROAD competition, bow and narrow competition, etc. The other mission of Wonorejo barrage is trying to develop mountain tourism concept in Tulungagung, so that the tourism concept not only in coast sector or agro business, but also the important public facilities can exposes for tourism. On day, Tulungagung is not only known as marble city, but also a city that presents many recreation places.